« Rally for net guru!! Stone, Blues exit 2018 with a bang!! They’re heading into the break on a high note. 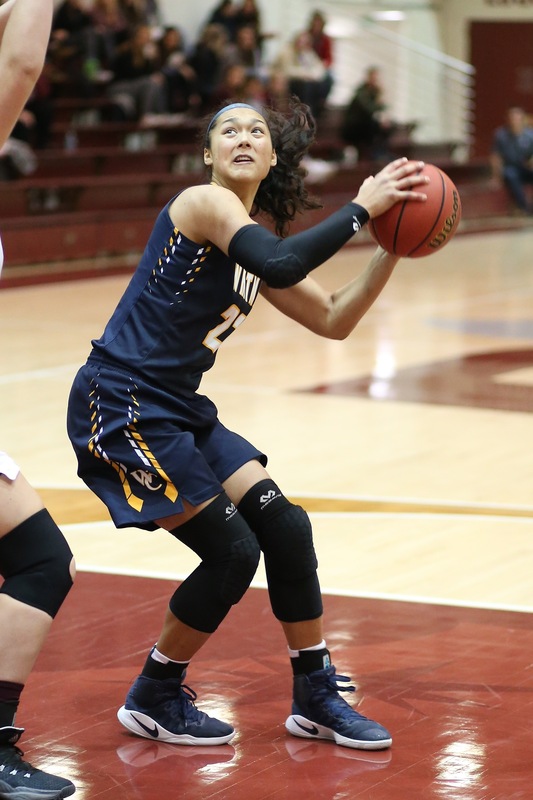 Roaring from behind Friday, the Whitman College women’s basketball team ended 2018 with a win, scorching The University of Northwestern 73-63. The victory gives the Blues a two-game sweep at the Hyatt Place December Classic in Santa Cruz, is their sixth win in their last seven games, and lifts them to 8-3 on the season. Now, Whitman, and its Coupeville star, junior Makana Stone, are off until Jan. 5. When they return to action, the Blues head into the heart of the league schedule, carrying a 2-0 mark in Northwest Conference games with them when they go to Oregon to face Lewis & Clark College. Whitman’s final 14 regular-season games are league rumbles, as it chases the conference title which has narrowly eluded it during Stone’s first two seasons on campus. Wrapping up tourney play in California, the Blues fell behind 21-15 after one quarter against a foe from Minnesota. Things quickly took a better bounce, however, as Whitman knotted things up at 33-33 at the half, eked out a one-point lead after three quarters, then hammered Northwestern in the final frame. The Blues took the lead for good at 55-54 a minute into the fourth quarter, after a series of fortunate events initiated by Stone. First, she went high to reject a shot, then, at the other end of the floor, the former Wolf fed teammate Maegan Martin for a game-busting layup, picking up an assist on the go-ahead bucket. Stone finished with 12 points, tying Mady Burdett for top honors, as four Blues notched double figures. She also hauled down nine rebounds, dealt out four assists, rejected three shots and made off with a crucial steal. On the season, Stone, who leads her team in 13 of 22 statistical categories, has 182 points, 94 rebounds, 20 assists, 16 steals and 17 blocks. She’s connected on 78-153 field goals and 26-36 free throws.